The squash takes about an hour to cook so we are going to start with that, then start working on our meat sauce. I like to cook my squash whole instead of cutting in half. I feel that it comes out the same, but it is a lot easier to cut into after cooking. So heat your oven to 375F and place your squash in a baking pan or a cookie sheet. Pierce your squash all over with a fork. Now while your squash is baking for an hour, we will start working on our meat sauce. Start by chopping your veggies (zucchini, onion, celery, garlic, carrots). For the zucchini I used 2 green and 1 yellow but it is up to you on what you prefer to use. Add your chopped veggies to a food processor. I do this because I enjoy my sauce not to have chunky veggies. But if you do not have a food processor or do prefer your veggies to be more chunky, chop to your preference! Next we want to heat up a frying pan with olive to medium-high heat. Fully cook your ground turkey that has been seasoned with 1/2 tsp of garlic powder and 1/2 tsp of onion powder. While your ground turkey is cooking. Start sauteing your veggies in a large pot with olive oil on medium-high heat. Stirring both the veggies and meat occasionally. Once your veggies have soften add your red wine vinegar then turn down heat to medium-low while waiting for the turkey to be done. Once your turkey is fully cooked, add to your veggies. Add your cans of diced and crushed tomatoes. Add basil, rest of garlic and onion powder, olive oil, and salt and pepper to taste. Mixing ingredients evenly together. Cover with lid and stir occasionally while waiting for your spaghetti squash to finish baking. The longer the sauce cooks the more flavorful it gets! Once your squash is ready let it cool until you are able to handle it. Slice the squash in half long ways and discard the seeds. Then with a fork shred the squash. 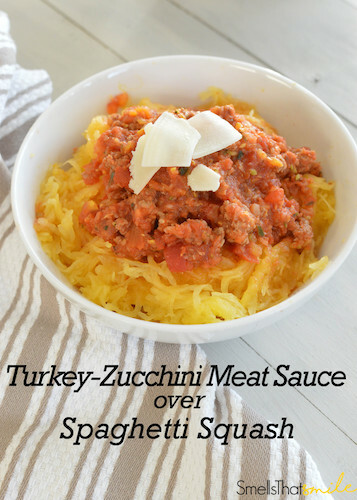 Serve your squash with meat sauce and enjoy! Place Spaghetti Squash on Cookie Sheet or Baking Pan. Pierce all over with a fork. After an hour of baking, take out of oven and let cool for a couple of minutes until you are able to handle. With a Sharp knife slice Squash in half long ways. Discard the seeds. Once cleaned out, take a fork and shred the inside of your squash. Heat up to medium-high with olive oil, a frying pan and a large sauce pan/stock pot. In pan, heat olive oil and brown your ground turkey with a ½ tsp of garlic powder and ½ tsp of onion powder. Once turkey is fully cooked add to pot. Mixed the ground turkey and veggies in the pot, add your can of diced tomatoes and crushed tomatoes. Add basil, garlic powder, onion powder, olive oil, and salt and pepper to taste. Mix everything evenly together. Cover with lid and stir occasionally. Let it cook until your squash is ready. The longer it cooks the more flavorful it gets!